I have been a supporter of the Peace Mala project for some years now, almost from the start. Never has there been a time when initiatives to promote understanding and trust between people of different faiths was more needed. The idea behind the project is simple and powerful - and it's fun! Children and young people - and adults! - really enjoy making the Malas, and learning about the faiths represented as they do so. I wear my Mala often, and it always provokes discussion. I have given Peace Malas to the President of Ireland and the Prime Minister of New Zealand. Both have been proud to wear them. We in Llanelli should be proud that this important international peace project began here. I know it will go from strength to strength. 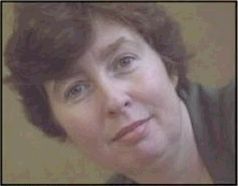 Helen Mary Jones was born in Colchester in 1960. She was educated at Colchester County High School for Girls, Llanfair Caereinon High School in Powys and University of Wales Aberystwyth. She has taught in special education and has held various positions in youth, community and social work. She has held a range of political offices at branch, constituency and national level and is currently the Plaid Cymru the Party of Wales Equal Opportunities Director. Prior to being elected as AM for Llanelli she was Senior Development Manager with the Equal Opportunities Commission in Wales. Helen was Shadow Minister for Education and Lifelong Learning, and a member of the Education and Lifelong Learning Committee, the Equality of Opportunity Committee, the South West Wales Regional Committee and also a member of the Voluntary Sector Partnership during the first term of the National Assembly. She contested the 1992 general election in Islwyn against the then leader of the opposition, and the 1997 general election in Montgomeryshire. Helen recently came second in the Plaid Cymru - The Party of Wales leadership contest. Her political interests include environmental issues, social justice, equal opportunities, children's rights and employment. She was also a member of the National Assembly Advisory Group. In 2003 Helen was elected as National Assembly member for Mid and West Wales, later becoming Shadow Minister for the Environment, Planning and Countryside. Helen is now CEO of Youth Cymru.